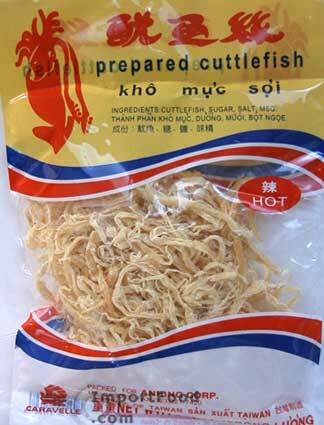 This dried cuttlefish is a premium quality product from Taiwan. It's dried and prepared, does not need refrigeration. A very popular snack throughout Asia, it tastes fresh. Regular flavor is not spicy at all. The "hot" flavor is just slightly spicy. The 2 oz package is a generous size. Ingredients (regular): cuttlefish, sugar, salt, msg. Product of Taiwan. Ingredients (hot): cuttlefish, sugar, salt, chile, msg. Product of Taiwan.